Random House to re-release What They Don't You at Harvard Business School in 2016. IMG's Co-CEO's, Ari Emanuel and Patrick Whitesell, write new introduction for book. 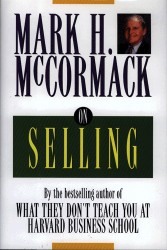 Profile Books publishes McCormack's bestseller in the UK and Commonwealth markets. 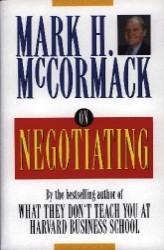 ﻿The advice contained in McCormack's business classic is more relevant for this generation of entrepreneurs than when it first appeared. In a world driven by analytics where smart devices rule and social skills are exercised primarily over online networks, young business leaders will benefit from the street smarts and wise counsel Mark not only preached, but practiced. Getting to the top is hard; staying there is even harder. 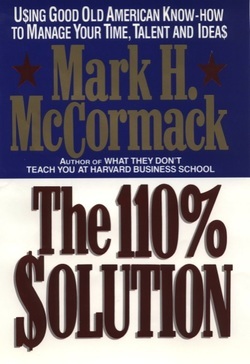 Remember: 80% of your business comes from 20% of your customers. Don't expect to be perfect because you never will be. Don't let the fear of failure get in the way of you taking risks. Give more than you take. The most successful people are givers, not takers.